The lowdown: There’s so many ways to talk about cider, but let’s begin with the basics. Cider is, by definition, fermented apple juice. The piping cup of steamy non-boozy cider you’ve likely sipped at the pumpkin patch is different in that it was unfermented and unfiltered. And while it’s often packaged and sold alongside beer, cider more resembles wine in taste and cultivation. As grapes are with wine, apples are crushed and the pulp pressed to extract juice; that juice is then fermented by yeast that converts sugar to alcohol. Cider-making is an age-old practice. Walk through the English countryside today and you could stumble upon the circular grinding stones used by early adopters to crush apples. With the help of invading Romans, farmers in England, France, and Spain perfected the fermenting process as early as 55 B.C., and those regions remain the world’s leading purveyors of cider—to this day it has yet to fall out of favor. The cider-making process was introduced to America by the first English settlers and, for a while, was extremely popular, with reports stating that by the turn of the 18th century New England was producing more than 300,000 gallons of cider a year. Water quality was less reliable back then, so cider was often the drink of choice for many families. That includes children, who consumed a drink known as ciderkin, a version of cider much lower in alcohol. The popularity of cider dropped off when bourbon and beer became easier to produce, and the passing of prohibition in 1920 killed off whatever cideries still remained. Only recently has cider regained its once-vogue status, a trend rekindled in the ’80s by the rise of apple-based brandies, followed by the popularity of Woodchuck Amber cider in the mid-’90s. Few among the cider cognoscenti would argue that Woodchuck was a quality cider, but its boom gave the beverage renewed relevance in the modern age. And as small craft cideries began blossoming throughout New England, the big boys began pumping out their own mass-produced ciders—Boston Beer’s Angry Orchard and Heineken’s Strongbow among them. It was both the popularity of these mass-produced ciders and the surge in craft beer culture that helped facilitate the rise and sustainability of new cideries. Not only were they popping up in the historically fertile New England countryside, but also in the Northwest and Midwest. 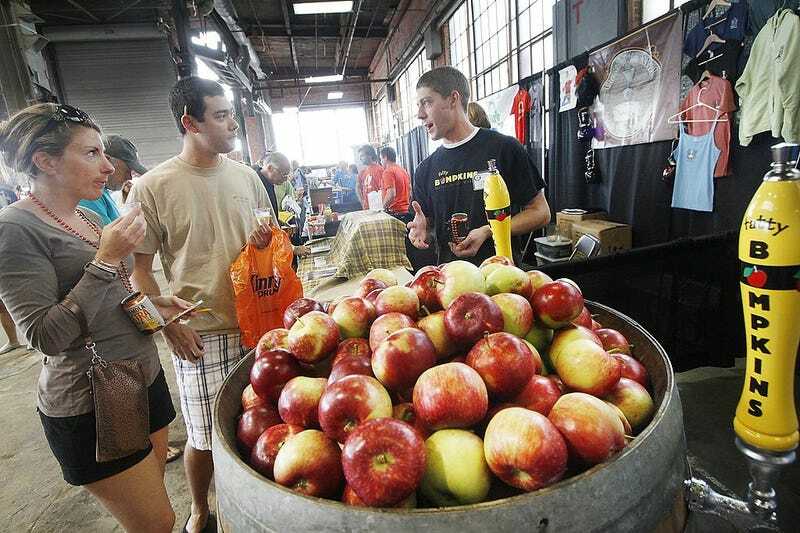 Michigan, especially, found a new identity in cider production, with many of the industry’s most exciting craft ciders emerging from the Mitten. No matter where you live, there’s a good chance that you’ll have at least one locally crafted cider sitting alongside the Angry Orchards of this world. The taste: Cider is also similar to wine in that the final product is shaped by its terroir, the catch-all word for the soil, topography, and climate in which the apples were cultivated. For this reason, cider will taste different depending on the region where it was produced. English ciders, for example, tend to be still, dry, and higher in alcohol than most ciders. (English ciders are often considered the red wine of the cider world.) Spanish ciders are more often compared to sour beers, with a funkier taste. French ciders are the most approachable of European ciders, as they have a champagne-like sparkle and are lower in alcohol content. Terroir isn’t all that differentiates European ciders from American ones, however, as their use of wild yeasts results in a bolder, more offbeat flavor profile. American ciders are harder to pin down, as the unique processes brewers have been applying to craft beer—barrel-aging, hopping, the addition of spices and other fruits—are also being used by cider makers, resulting in a variety of different tastes. What most American ciders have in common, however, is lightness, crispness, and an easy-going approachability. Many bars classify styles not just by region, but also by their level of dryness and sweetness. It’s not rare to see categories like dry, off-dry, semi-sweet, or farmhouse applied to ciders, and this can be a handy way of pinning down what you dig. Dry ciders have a thin body and an astringent taste due to their lack of sugar, and are best suited for the adventurous drinker. Off-dry ciders have a touch more sugar and a more robust body, resulting in a smoother mouthfeel to counteract the slight astringency. These ciders are considered by most to be the ciders that pair best with food. Any cider with more than 2 percent residual sugar is classified as either semi-sweet or semi-dry (the difference is negligible). You’ll get the most apple flavor out of these ciders, which tend to be rich, smooth, and delicious but can also result in a hell of a headache if you’re not careful. Farmhouse ciders are similar to farmhouse beers in that the astringency is dialed down in favor of more earthy notes—you’ll find a slight funk, but not as much as you’re likely to get from a European cider. Possible gateway: Any cider fan would tell you to stay away from the mass-produced brands, as they tend to be loaded with fructose fillers that have a cloying, sugary aftertaste. Luckily, the last few years have found more and more quality cider brands enjoying mass distribution. Take Fennville, Michigan’s Virtue Cider, which was founded in 2011 by Gregory Hall, formerly brewmaster of Chicago’s Goose Island Beer Company. Virtue’s Michigan Brut is aged in French oak barrels and can serve as an ideal gateway for beer lovers, as its dry, tart bite is significantly dialed down in sweetness. As approachable as they come, Seattle Cider’s Semi Sweet Hard Cider is a strong choice for the palate more familiar with cocktails than beer. The apple dominates both the aroma and taste, with notes of lemon and cinnamon that remain subdued for a smooth mouthfeel. For those in the Northeast, another solid option is Shacksbury’s Semi-Dry, which balances its sweetness with a touch of farmhouse earthiness to complement the fruit-forward bouquet. Next steps: Everybody’s had a cup of hot cider before, but Blake’s El Chavo delivers a different kind of heat. The cider makers at this Armada, Michigan, cidery mix habanero peppers and mango into this bizarre, delicious beast, with the mango encompassing the aroma and the heat taking on a round, gradual quality that’s pleasant, not painful. Some criticize cider for not having enough of a kick; El Chavo should placate those complaints. “Sidra” is Spanish for cider and thus what we call Spanish-style ciders in America. While any Spanish-style cider in the States won’t taste exactly like one in Spain—different land, different apples, different tastes—they will be manufactured in the way Spaniards made famous: fermented slowly with wild yeasts that produce a pungent odor and a vinegary taste. Finnriver’s Sidra leavens the bitterness with tartness and a touch of organic cane sugar, and, though its traditionally served still, Finnriver puts a stamp on their version with some slight carbonation. Talk like an expert: Tannins are, most simply, natural preservatives that live in the skin and stems of apples (grapes, too, but we’re talking about apples), and play a big part in the taste of cider. Traditionally, the more tannins an apple has, the more body the resulting cider will have. Apples characterized as bittersweet and bittersharp tend to have the most tannins, and thus are cherished by cider aficionados. These include apple varieties such as Dabinett, Nehou, and Kingston Black, so to name-drop any one of these is to flaunt your knowledge in ways that will no doubt impress.